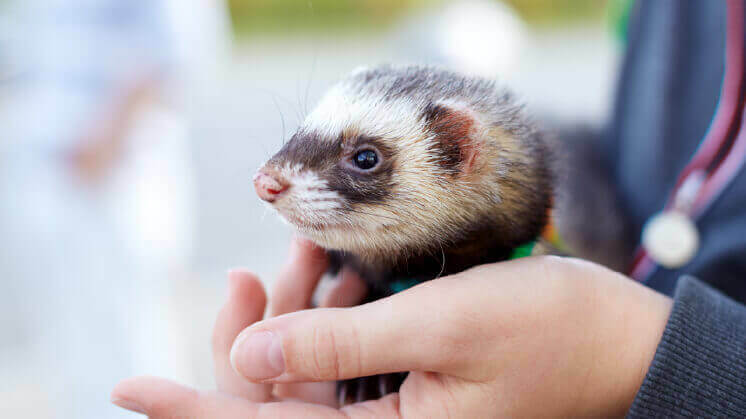 While there are only two “breeds” of ferrets (standard and angora), the terms used to describe ferrets can be quite confusing for new ferret owners. You may hear of whippet or bulldog ferrets, hybrid ferrets, and sable ferrets, none of which describe an actual breed. Here we’ll demystify these terms and more. Angora ferrets are the result a genetic mutation discovered by a Swedish ferret breeder, whose ferrets produced longer hair on their rumps. He sold the stock to a fur farm, which continued breeding the ferrets to create what we now know as the angora. Angoras have an extra fold in their nose, usually with a tuft of fur outside, inside, or covering the nose. The undercoat of an angora ferret is the same length as their overcoat, which is longer than a standard ferret’s, 2-8 inches (5-12.7 centimeters) long. 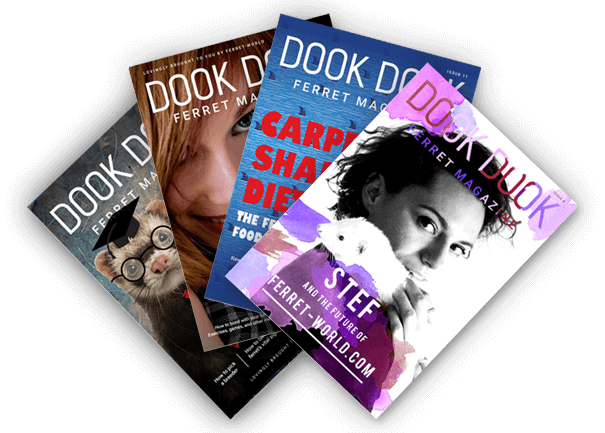 In standard ferrets, the undercoat is much shorter than the overcoat. Standard ferrets can vary wildly in size and body shape, from a whippet body type (long, thin, and slinky) to a bulldog body type (shorter and block-shaped). Breeders usually prefer the bulldog shape, so you rarely see whippet angoras. 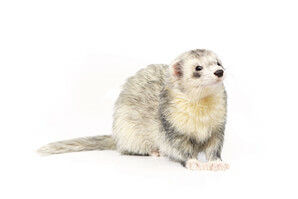 Angoras that have been cross-bred with standard ferrets will usually have longer overcoats than standard ferrets, but will not have the extra fold in their nose or the long undercoat. Because the angora was originally created by a fur farm, they were likely not too interested in creating genetically healthy ferrets. As a result, angora ferrets may have some undesirable traits and come from a very small gene pool. Angora breeders try to fix these issues by cross-breeding angoras with standard ferrets to expand the gene pool and select for positive traits. 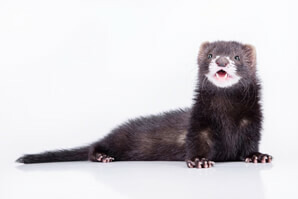 A hybrid ferret is a cross between a European polecat (Mustela putorius, one of the ferret’s ancestors) and a domesticated ferret (Mustela putorius furo). Some breeders produce hybrids and partial hybrids because they believe that doing so will help strengthen the ferret gene pool. 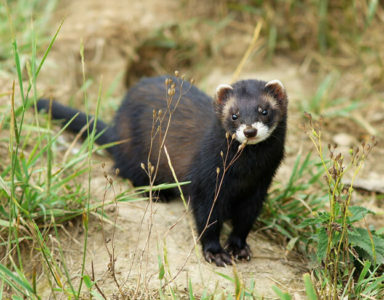 Domesticated ferrets have been selected for positive traits, but European polecats have not. This means that hybrids sometimes lose those traits that make ferrets good pets. Hybrids may dislike humans, not tolerate handling, and react poorly to being caged. They tend to be less comfortable with new environments and people and need more enrichment to avoid becoming bored. 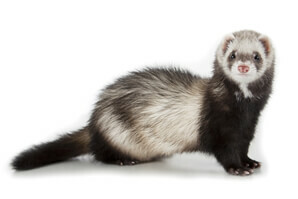 In short, hybrid ferrets may be more difficult to keep as pets than fully domesticated ferrets. 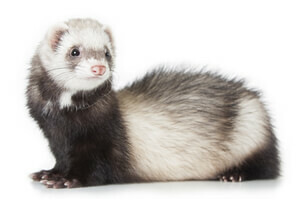 When people talk about ferret breeds, they typically are referring to coat colors and markings. However, differently colored ferrets are not different breeds. 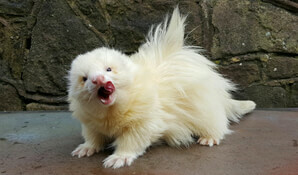 The same litter of standard or angora ferrets may have a wide variety of coat colors and markings. 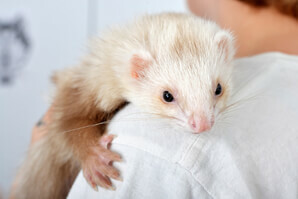 Sable ferrets have a white, cream, or light golden undercoat and a warm dark brown overcoat. Their eyes are usually dark. 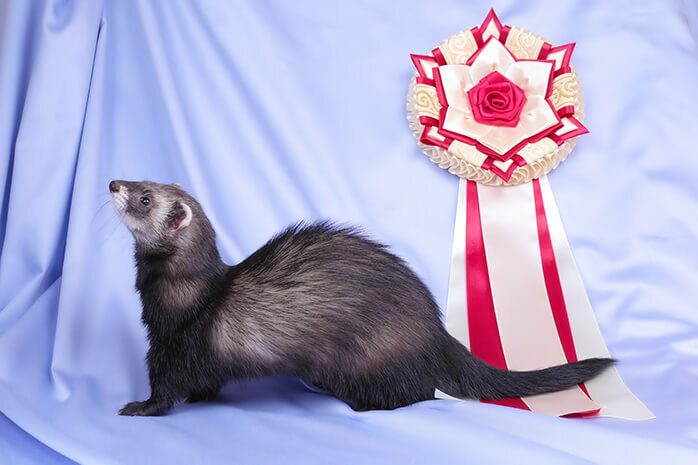 Black sable ferrets have a white or cream undercoat and a dark blackish-brown overcoat. Their eyes are usually dark. 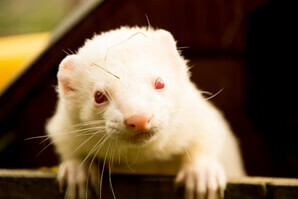 Albino ferrets have a white or cream coat and red or pink eyes. 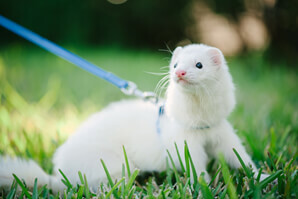 Dark-eyed white (DEW) ferrets have a white or cream coat with burgundy or black eyes. Champagne ferrets have a white or cream undercoat and a tan or light chocolate-colored overcoat. They usually have burgundy eyes. Chocolate ferrets have a white undercoat and a warm chocolate brown coat. Their eyes are usually dark. Cinnamon ferrets have a white or light golden undercoat with a light reddish-brown overcoat. Silver ferrets have a white undercoat with a gray/silver overcoat. Masked ferrets have a band of color around and between each eye, like a racoon’s mask. Bib ferrets have a white patch under their necks. Mitt ferrets have white feet where the white stops at least at the ankle. Stocking ferrets have white feet where the white extends halfway up the leg. 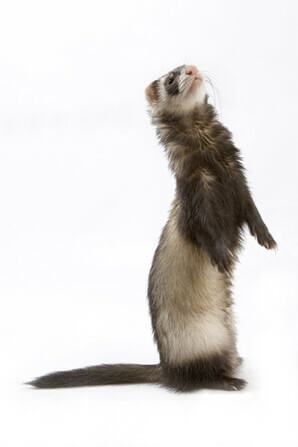 Point ferrets have a different color concentration (normally darker) at their feet, noses, and tips of their tails. Roan ferrets have an overcoat that is mixed brown (or silver) and white. Blaze ferrets have a white stripe running down the middle of their foreheads. Panda ferrets have a white head where the white extends at least to the shoulders. Self (milkmouth) ferrets have a solid color from head to tail, but may have white at their nose and lighter “eyebrows.” Their undercoat is usually not highly visible. Solid ferrets have a solid color from head to tail with a tiny bit of white on their chin. Their undercoat is not usually highly visible. Marked ferrets have a line of color running down their backs and on their tails. 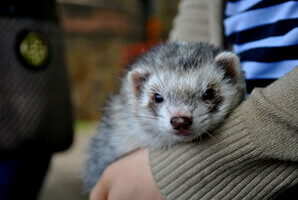 Most ferret coloring and markings are the result of genetic mutations. The only standard ferrets are masked sable ferrets and albinos. Unfortunately, these are among the least popular, meaning that many, many ferrets are bred to produce unusual markings, leading to inbreeding and other poor breeding practices. While standard markings are by no means a marker of genetic health, non-standard ones are often a marker of poor genetic health. In particular, ferrets with a blaze or panda pattern are extremely likely to have Waardenburg syndrome, the most obvious symptom of which is deafness. Dark-eyed white (DEW) ferrets may also have Waardenburg. Researchers estimate that up to 75% of blaze and panda ferrets are deaf and all are at least partially hard of hearing. Like with humans, Waardenburg can also cause cranial deformities and intestinal issues. 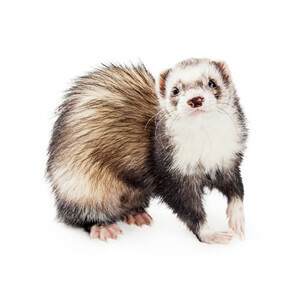 While it may be tempting to get an angora ferret or a ferret with abnormal coloring and markings, selecting your ferret based on how pretty you find them is a bad strategy. It also increases the demand for ferrets with genetic mutations from smaller gene pools. 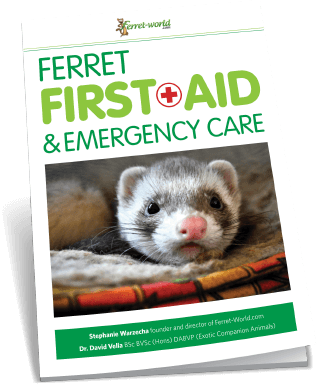 You should always select your ferret based on health, genetic history, and temperament. 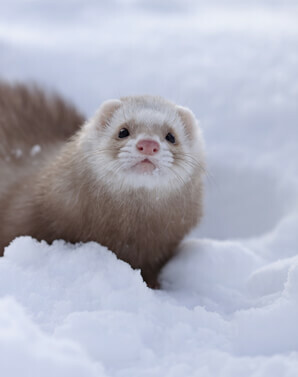 If you don’t know a ferret’s genetic history, it’s best to select a standard ferret (not an angora) with standard coloring and markings (a masked sable or an albino).